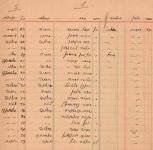 In 1931 a census was conducted in Palestine - Eretz Israel. This is the only city we have found the lists for. The information is arranged in groups. The information pertaining to the language the person speaks and if the person can write will not be transcribed. The researcher will be able to see this on the scan which will be on the IGRA website.